Become a member of LEVAS to fish on our waters! 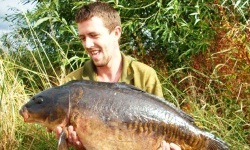 Click to see more on Long Eaton Victoria Angling Society's Waters. Click here to view information for LEVAS Juniors. Find out how to get involved! Welcome to the website of one of the oldest Angling Clubs in the UK - and probably the world, having operated successfully since March 1880. We were one of the founding members of the National Federation of Anglers (NFA) which has now "morphed" into the Angling Trust. We remain strong members. Our base remains firmly in Long Eaton (Derbyshire), midway between Nottingham and Derby, north of Leicester and South of Sheffield. We have a great deal to offer the coarse angler, whatever their interests. 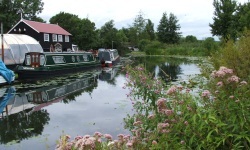 We control a long stretch of the Erewash Canal (which has around 125 permanent pegs spaced 20m apart) in Long Eaton. This runs from the Derby Road Lock to Trent Lock - very popular with both pleasure and match anglers. Although poluted in 2012, it is now on the way to recovery following successful stockings of roach, bream, perch, tench, rudd and chub, with over 120,000 fish from fry size to over 3-00 in weight released. Day permits (sold on the bank) & members water. Memberships may be obtained from Bridge Tackle, Long Eaton. Immediately below the Erewash Canal (Trent Lock) we have a short stretch of the River Trent (maybe half dozen pegs) before entering Cranfleet Canal, the first 200 yards of which are an offshoot of the river before reaching "flood gates". These remain open excepting when the Trent carries extra water when they are sealed to maintain the levels below the gates at manageable levels. We control fishing down to the footbridge and for a short stretch below. At the bottom end of Cranfleet Canal is Cranfleet Lock, below which is the River Trent. Day permits and members. Our "Long Eaton" stretch of the Trent (immediately opposite Thrumpton) runs from below Cranfleet Lock for two long marshes. It is a navigable stretch of river that offers a variety of fishing. Generally the top end is shallower (5'-6') and the bottom end deeper (8'-10'), although there are shallows, holes, back eddies and features all along the stretch, which offers some superb barbel fishing with fish to 16-00 taken. It also holds large chub, carp, bream, pike, and at the bottom (deeper) end, tench. Roach, perch, bleak and gudgeon show all the way through. This stretch (members only - although match bookings are taken) is popular with night anglers. Adjacent to the lower end of the Erewash Canal lies Fletchers Pond - a local carp mecca controlled by LEVAS for many years. Although the lake holds a wide range of species, most anglers fishing here seek the big carp (several fish over 30-00 in weight, and several more in excess of 20-00). LEVAS only stocks this lake with mature carp to maintain sport levels (the plan being to move fish on from Grange Pond appropriately - as they reach the 20-00 size). Fishing at Fletchers is open to members only as long as the Fishery Rules are adherred to. Grange Pond is a beautiful lake in Long Eaton around which are 30 permanent pegs. A Members Only water (aimed at the "pleasure angler" of all ages) it is accessed by key and has a reasonably secure car park. There is disabled access to some pegs and, with a footpath around the lake, reasonable access to all pegs. This lake is stocked with carp (to 20-00), tench (to 7-00), pike (20-00), bream (to 4-00), roach, perch and chub. Although accessed through a housing estate you feel "out in the country" in the pleasant surroundings, lush bankside vegitation, and plentiful wildlife. 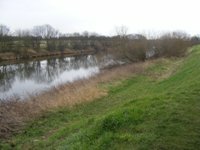 The River Trent at Colwick is another superb river fishery, and accessed through Colwick Park it lies opposite Holme Pierrepont, with the canoe slalom water running into the river on the opposite bank (a wonderful barbel & chub area). This stretch has slacks, fast water, deeps and shallows, and produced barbel, chub, carp, pike, bream, tench, roach and perch (as well a break, gudgeon and the odd trout). Some pegs are difficult to access (steep) but have stone steps. There are plans to bridge the stream that runs in by the early pegs. This is a Members only water (excepting match bookings are taken), memberships can be obtained locally from our Bailiff Mick FARRELL (telephone to arrange on 07989 780718) or Gerry's Of Nottingham during shop hours. LEVAS controls the River Soar both upstream and downstream from Kegworth Bridge. There are 10 pegs on the "Horseshoe" (see photo to left) immediately above the bridge and another 10 may be accessed by passing under the bridge and downstream. These pegs are a superb fishery all year round, with barbel, carp, chub, roach, bream, pike and zander. Above where the canal enters the river are another 15-20 pegs upstream, and at the top of this is a wier and lock gates. LEVAS controls the "Lock Island" - several pegs of superb barbel fishing. All this is Members Only - join at Soar Tackle, Market Place, Kegworth, although again match bookings are taken. Hopefully this has given a flavour of what LEVAS has to offer in terms of waters. You can gain detailed information on all of these (including maps, access and parking) from the Our Waters pages. LEVAS runs angling competitions from June to December each year. There are currently 20 matches scheduled, all of which count towards the "Club Championship" - the top three receive trophies, and each match individually has a trophy to be won. These matches are mainly fished on commercial fisheries and are open to all members, who must book in for each match with the Match Secretary. The fixture list and all match results may be found on this website under "Matches", click on the appropriate dropdown for Fixtures or Results. At the end of every "season" LEVAS hold their Annual Prizegiving event locally. All Trophies won throughout the year are presented at this event - including the presigious "Member of the Year Trophy". There is either a "sit down meal" or a "buffet", a quiz, raffle and lots of opportunity to chat to members and guests. Just before Christmas each year we locally hold a Social Evening for the presentation of prizes won at our Annual Christmas "Fur & Feather" match (a meat and often a booze prize for every attending competitor). There is also a buffet meal, a raffle a quiz, and plenty of laughter (optional). Any member (with partner or guest) may attend either of these events - but all attendees must book in with the General Secretary. Details of all events will be "advertised" on the "News" pages of this website. Are you a new or existing member of LEVAS? Are you considering becoming a member? Are you looking for somewhere to fish in the Long Eaton area? and how best to fish for them? If so, there is something within these pages that will be of interest to you. Lots more – if you don't see what you want, tell us and we will see what can be done! I hope you find the contents informative and useful.